How are you all doing so far this week? I hope it is a good one for each and every one of you. I will be picking the winner of my Domino Book Kit tomorrow night! Yay! I wish each of you luck. If you have not yet entered to win, just go to THIS post. Make sure you leave info on how to reach you if you win. 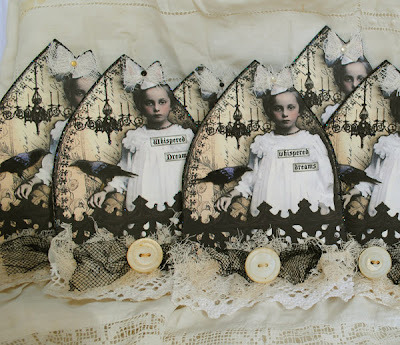 I have had a few moments to play and created these Gothic Arches for a swap over at Paperwhimsy. Creating is such an enjoyable venture! I was thinking today about how young I was when I first realized that making things from paper is my favorite thing to do...and I had a memory of sitting at the kitchen table cutting out paper dolls the way my grandmother taught my sisters and I, I think I was about 6 or 7 years old. I still love making things with paper! I have been out and about in Blogland and was unable to comment on some blogs. Just know, I do love to visit you! Hi Terri...I really love the Gothic Arches and they put me in the Halloween mood. I think your fall cups are lovely! I especially like the green handle on the second cup. Such an interesting wonderful touch. OMG Terri your arches are fantastic. 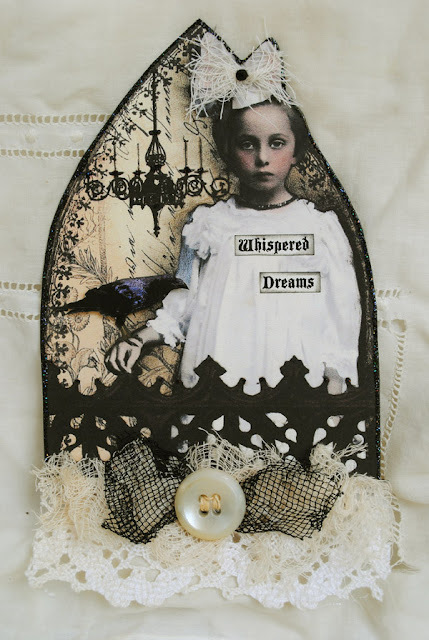 Dear Terri, your arches are WONDERFUL ,love the crow, and all the little extra`s you added. Terri I just switched to Firefox-from Internet Outlook -that did give me acces to comment on all blogs, where I before could not! I love these. I hope you will come join my linky party! wooow this looks wonderful! beautiful, I love it! I am crossing my fingers for tomorrow!Have a nice day! Hi Terri, your gothic halloween are wonderful. I like the arches, too! and the buttons, and lace...very nice. You are an especially talented lady. I love your arches! Such a fun swap. 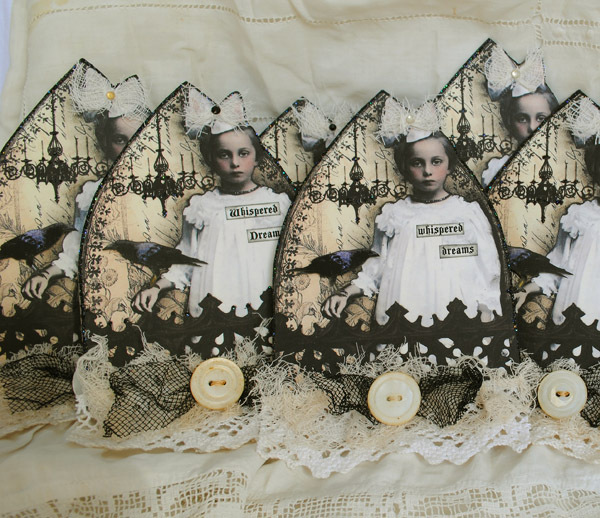 I played with paperdolls too! And I still have some! :) I love just looking at them. Yes, commenting on BLOGGER is getting more and more frustrating. It has something to do with ones COOKIES. I love cookies, don't get me wrong, but apparently these cookies are interferring with comments. SO, if I can't leave a comment, I try to email the person. Have a great day my sweet Terri! Fabulous Gothic arches, I wish I had been able to look over your shoulder when you were making them. Gorgeous work! I too have always loved paper and cutting things out. When I was little I would cut images out of catalogs and create layouts of what my "adult" kitchen, bathroom, bedroom, etc. would look like. I used to (and still do) LOVE paper dolls. Oh, Terri! Your arches are just gorgeous!!!!!! You have such wonderful talent--these are incredible!!!! Terri, your gothic arches are gorgeous! The colors and details are absolutely amazing!